We present a flexible model-based approach for the recovery of parameterized motion from a sequence of 3D meshes without temporal coherence. Unlike previous model-based approaches using skeletons, we embed the deformation of a reference mesh template within a low polygonal representation of the mesh, namely the cage, using Green Coordinates. The advantage is a less constrained model that more robustly adapts to noisy observations while still providing structured motion information, as required by several applications. The cage is parameterized with a set of 3D features dedicated to the description of human morphology. 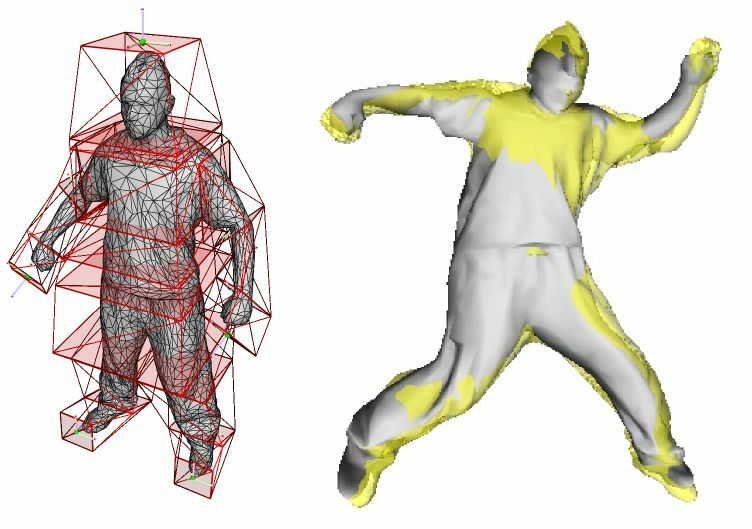 This allows to formalize a novel representation of 3D meshed and articulated characters, the Oriented Quads Rigging (OQR). To regularize the tracking, the OQR space is subsequently constrained to plausible poses using manifold learning. Results are shown for sequences of meshes, with and without temporal coherence, obtained from multiple view videos preprocessed by visual hull. Motion recovery applications are illustrated with a motion transfer encoding and the extraction of trajectories of anatomical joints. Validation is performed on the HumanEva II database. Duveau, E., Courtemanche, M., Reveret, L., Boyer, E., "Cage-based Motion Recovery using Manifold Learning", 3DIMPVT 2012,, Zurich, Switzerland, 13-15 oct, 2012.